Decapods have ten limbs. Some are walking legs, others are pincers. They are found in a wide range of habitats. Many can tolerate being out of water. Some live with other animals; anemone shrimps, porcelain crabs. Delicious Decapods! Decapods include our favourite seafood! Having to personally dismantle some of these creatures to eat them, many of us are more familiar with them than we might imagine. Decapods include crabs, prawns and shrimps, lobsters and hermit crabs. What are decapods? 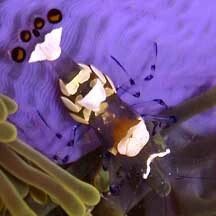 Decapods represent almost one-quarter of all known crustaceans. Features: 'Deca' means ten and 'poda' means foot. Indeed, members of this Order have 10 leg-like appendages. 5 pairs are usually walking legs while 1-3 may be tipped with claws. The abdomen may also have appendages called pleopods that are used in swimming. Or to generate water currents, particularly important for females that brood eggs or young. The tail is made up of a pair of abdominal appendages called the uropods. The head and thorax are rigidly fused and not separated by a flexible joint. Sometimes, the head and thorax may be covered by a carapace or shell so that these function as a single unit called the cephalothorax. The shell may be hardened with calcium compounds. Most have compound eyes and two pairs of head appendages (insects only have one pair of antennae). The head also has smaller appendages, including the mandibles that crush food and maxillae that generate water currents and help manipulate food. Most have appendages that are branched (biramous). These may function as gills or gill-cleaners. 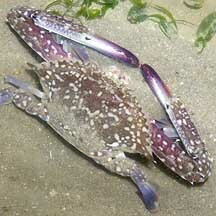 True crabs or Brachyurans: There are about 4,500 known species in nearly 50 families. True crabs generally have have a reduced abdomen that fits under the cephalothorax resulting in the typical crab-shape that we are all familiar with. Not all crab-like animals are true crabs. 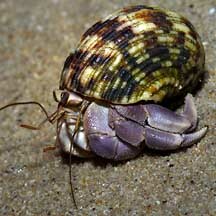 For example, porcelain crabs are Anomurans. Human uses: Decapods are eaten by people everywhere. But not all crabs are edible. Some crabs in fact, are highly poisonous and their toxins are not destroyed even by cooking. Eating such crabs can kill humans. Crabs may also concentrate unpleasant substances from the food that they eat. You may get ill eating these crabs. Don't eat any crabs that you caught yourself in the wild. Status and threats: Sadly, many of our beautiful and fascinating decapods are listed among the endangered animals of Singapore. Like other marine creatures, they are vulnerable to habitat loss due to reclamation or human activities along the coast that pollute the water. They are also vulnerable to trampling by careless visitors and over-collection for food can affect local populations. 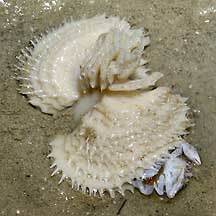 Porcelain crabs often live with other animals. Anemone shrimps live in a sea anemone! Decapod crabs on the Life on Australian Seashores by Keith Davey on the Marine Education Society of Australia website: Fact sheets with photos, labelled diagrams, and even animated gifs with details on various species found in Australia. Gopalakrishnakone P., 1990. A Colour Guide to Dangerous Animals. Venom & Toxin Research Group, Faculty of Medicine, National University of Singapore. 156 pp. Morton, Brian & John Morton, 1983. The Sea Shore Ecology of Hong Kong. Hong Kong University Press. 350 pp.